A one-day exhibit at Tolson’s Chapel presented by Michael Bodin, Saturday, August 22, 2015. Hours are 10:00am to 3:00pm, free and open to the public! Welcome GeoWoodstock XIII geocachers and Sharpsburg Memorial Day Parade goers! Tolson’s Chapel will be open for tours on Saturday, May 23 from 10:00 a.m. to 4:00 p.m. Geocachers attending the GeoWoodstock XIII, we hope you will stop in for a tour! Sharpsburg Memorial Day Parade-goers, come see what Tolson’s Chapel is all about! Sun Shines on Tolson’s Chapel Dedications! 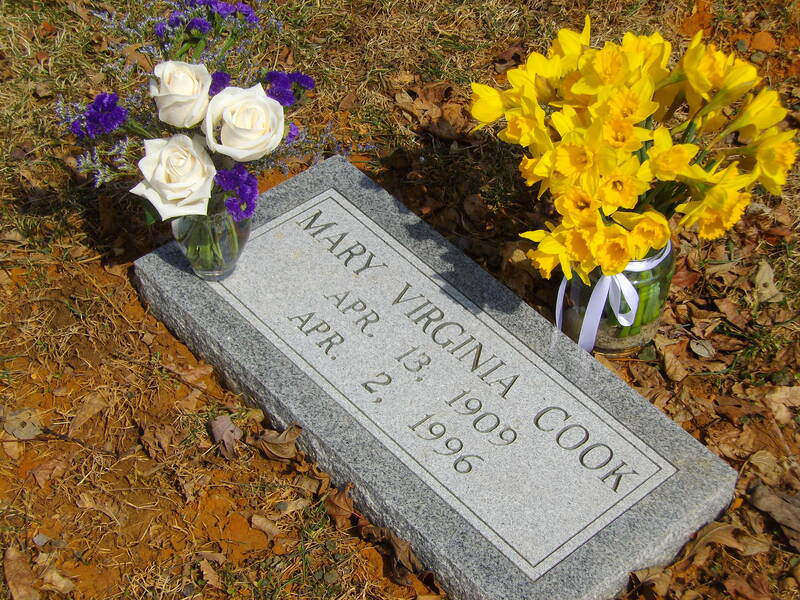 On Saturday, March 21, the Friends of Tolson’s Chapel dedicated the new gravestone marking the final resting place of Mary Virginia Cook, the last member of the Tolson’s Chapel congregation who passed away in 1996. Her grave site was never marked with a stone. 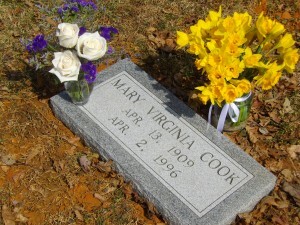 In April 2014, the Mayor and Council of the Town of Sharpsburg initiated the Virginia Cook Memorial Fund, collected over $1,000 for the purchase of a gravestone. Most of the donations came from local residents who fondly remembered Ms. Cook. A gathering of family members, friends and neighbors, Mayor Speilman, and Julianna Albowicz representing Senator Barbara Mikulski, attended the dedication of the new headstone. 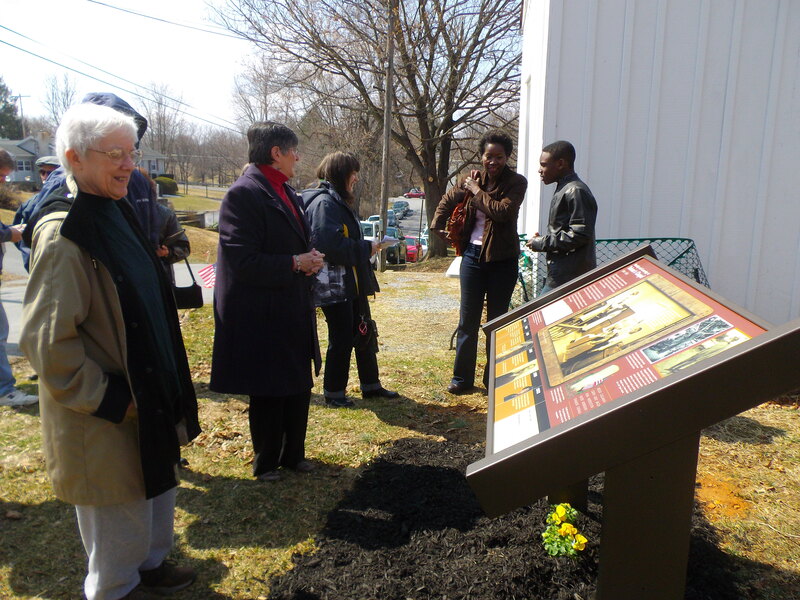 Bathed in the exceedingly welcome warm sunlight of the day, the gathering also marked the unveiling and dedication of the new wayside exhibit at Tolson’s Chapel. Funded by grants from the Community Foundation of Washington County (Mary K. Bowman Fund) and Preservation Maryland, the outdoor exhibit was designed by Interpretive Direction, LLC of Harpers Ferry and installed by the maintenance crew from Antietam National Battlefield. The exhibit provides much-needed interpretive information and illustration for the chapel, which is open for tours only on special occasions or by appointment. Central to the theme is the Freedmen’s Bureau school, housed in the chapel from 1868 to 1870, represented by a photographic recreation of the first day of school (April 6, 1868). Twelve local children volunteered to pose for the photograph and costumes were provided by the Antietam National Battlefield educational program. The part of the white teacher from Philadelphia was played by Andrew Rowand, a recent graduate of Shepherd University and a Civil War reenactor. Many thanks to all who helped make this possible! Second Annual Gala Fundraiser Dinner, Saturday, April 11, 2015. 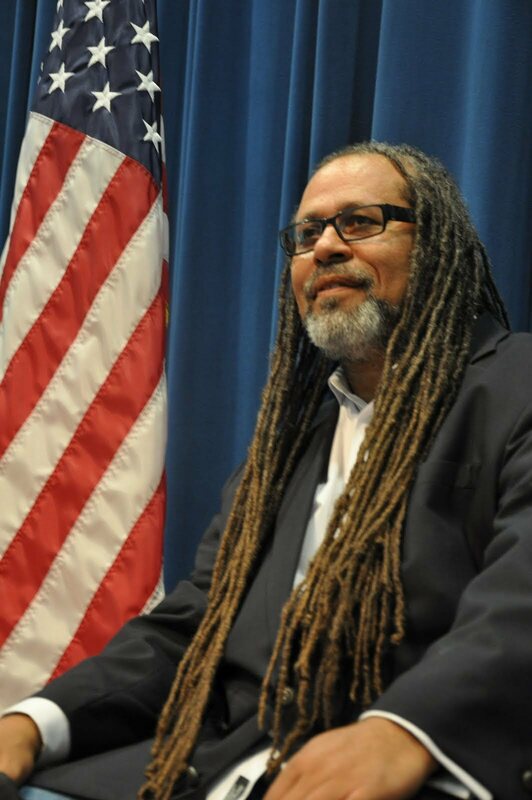 Our local NBC affiliate television station is running a series on African American history in Washington County this month. Here is the first installation, a segment on slavery in Washington County. The Tolson’s Chapel celebration of the 150th anniversary of emancipation in Maryland was a huge success with a standing-room only crowd! Keynote speaker, Dr. Hari Jones, curator at the African American Civil War Museum in Washington DC, gave a rousing talk about the positive impact of emancipation in Maryland, not just for the enslaved people who gained their freedom, but also it freed the enslavers, and American society that allowed slavery to continue, from the stain of slavery. Dr. Jones reminded us to remember those who gave their lives – on both sides of the conflict – during the American Civil War. The local NBC television station, NBC25, led the evening news with our event! You can find that story here: http://www.your4state.com/story/d/story/maryland-marks-150th-anniversary-of-emancipation/35900/-kNQfKsOq02ExKfhhqgB7Q. 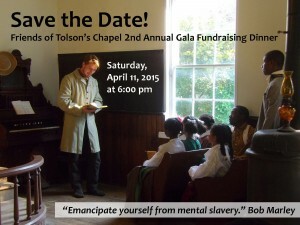 Celebrate the 150th Anniversary of Maryland Emancipation at Tolson’s Chapel! Join in a celebration of the 150th anniversary of Maryland Emancipation at Tolson’s Chapel on Saturday, November 1st, 2014! The chapel door will open at 1:00 pm for tours and refreshments. At 2:00 pm, our celebration begins, featuring gospel music, a conversation with emancipated slave Teany Watson (by Washington actress Jayné Price), and thoughts on emancipation by our keynote speaker Dr. Hari Jones from the African American Civil War Memorial and Museum (Washington DC). The chapel will remain open for tours and refreshments following the celebration until 4:00 pm. 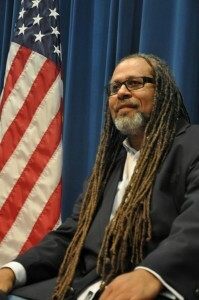 Hari Jones is the curator of the African American Civil War Museum in Washington, DC. He is one of the foremost authorities on the role of African Americans in the Civil War. Hari presents a refreshingly new perspective on the subject. In his matter-of-fact manner, he reveals just how extensive and well-organized African Americans were in their efforts to end slavery and secure their rights as citizens. Before Hari fully immersed himself in the military history of Americans of African descent, he served in the United States Marine Corps for over twenty years. He retired as a captain in 1997. Since then he has conducted extensive research on the African American overt and covert military activities throughout American history. Hari was a content developer for the National Park Service (NPS) museum at the Tuskegee Airmen National Historic Site in Tuskegee, Alabama, a content adviser for the American Civil War Center exhibit Take Our Stand and a content adviser for the National Archives and Records Administration (NARA) exhibit Discovering the Civil War. Television outlets, includingthe History Channel, Public Broadcasting System (PBS) History Detectives, Henry Louis Gates’ series The African American: Many Rivers to Cross and NBC’s Who Do You Think You Are? have also sought his expertise. Hari has written five historical works in his series For Light and Liberty. Volume one entitled The Road to Emancipation was published in November 2012. 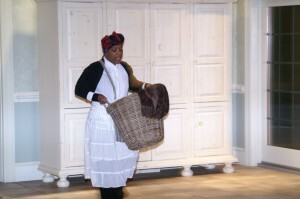 Jayné LaMondue Price (Teany Watson) first brought Teany to life in the play Antietam Anthologies, written and produced by Mark Brugh. She continues to demonstrate her versatility, skill, and passion for the stage and has performed in the Playmakers 2009-10 season production Heaven Can Wait and was a member of the stage crew for Catch Me If You Can. She holds a BA in Labor Studies (Professional Development) and through her business JLP Enterprises, provides exclusive entertainment promotion and event planning services including artist representation and booking, planning, coordinating and promoting events and entertainment. She spent over 20 years on the West Coast and is a native of Memphis, Tennessee, having received her theatrical training under the direction of writer/director/producer Silvia Cooper Nelson. Her professionalism, voice, and motivating personality are often sought after to serve as Mistress of Ceremony to enhance many events. For more information, contact: Edie Wallace, Friends of Tolson’s Chapel, tolsons.chapel@gmail.com. Check out this Herald-Mail story about our presentation for Black History Month in Hagerstown on February 9th, 2014: “School in Sharpsburg’s Tolson’s Chapel part of presentation during Black History Month” This is the tenth year a program has been put together for Black History Month in Hagerstown! In this wonderful season of giving, please consider donating to the Friends of Tolson’s Chapel. We are a 501(c)(3) tax-exempt non-profit and, dare I say, desperate for annual operating funds (maintenance, insurance, mowing). Please help us keep this historical gem in its beautifully restored condition so we can continue to share its special story!